The Greeks and Romans knew well how poisonous lead is to humans. The symptoms and signs of lead poisoning were first detailed in the second century BCE, and when the Romans built aqueducts they recognised that water supplied through lead pipes was not as ‘wholesome’ as that from earthenware. By 1656, the German physician Samuel Stockhausen had recognised that lead dust and fumes were responsible for the symptoms which were widespread among lead miners, smelter workers, and others who were exposed to lead and its salts. For painters, though, Lead White was and remained the white pigment of choice for oils until the end of the twentieth century. Both dangerous and difficult to prepare, large quantities of Lead White pigment had to be produced for the preparation of oil-painting grounds, as well as its use as the colour white. All that time, though, there was a non-toxic alternative in the form of zinc oxide, the same white that (more recently) makes zinc oxide plaster white. It took until 1780 for artists to look seriously for alternatives to Lead White, and even then zinc oxide was only very slowly adopted in oil painting. It did, though, become popular in watercolour, where it was known as Chinese White when first marketed by Winsor & Newton in 1834. It is, of course, neither Chinese nor of Chinese origin. George Morland (1763–1804), Fishermen Pushing a Boat into the Water (Beach Scene) (1793), oil on canvas, 40.1 x 51.7 cm, Bayerische Staatsgemäldesammlungen, Munich, Germany. Wikimedia Commons. 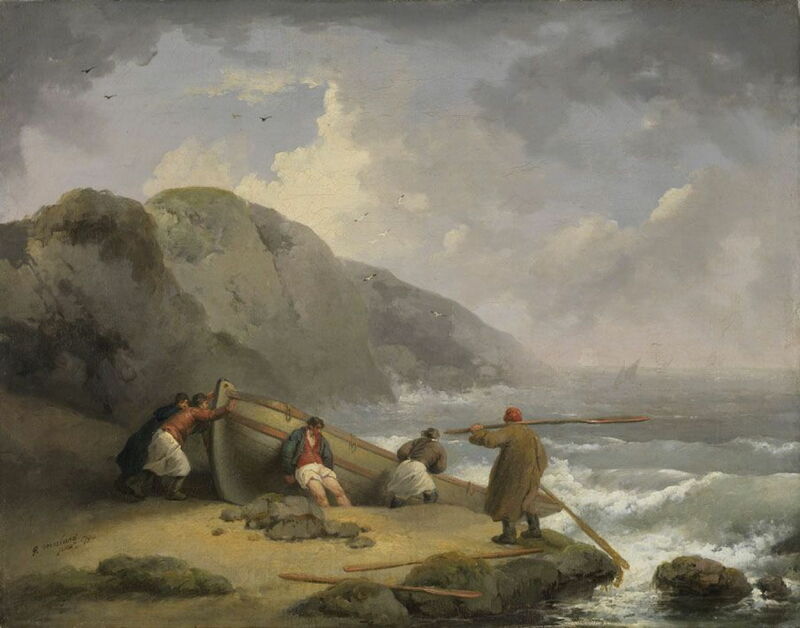 George Morland’s Fishermen Pushing a Boat into the Water or Beach Scene from 1793 appears to be one of the first oil paintings to have used Chinese White. Unfortunately, natural sources of zinc oxide are overwhelmingly in the impure mineral form of zincite, which is red in colour. Small-scale production had taken place since ancient times, but it wasn’t until the early nineteenth century that industrial manufacture brought quantity and more consistent quality. 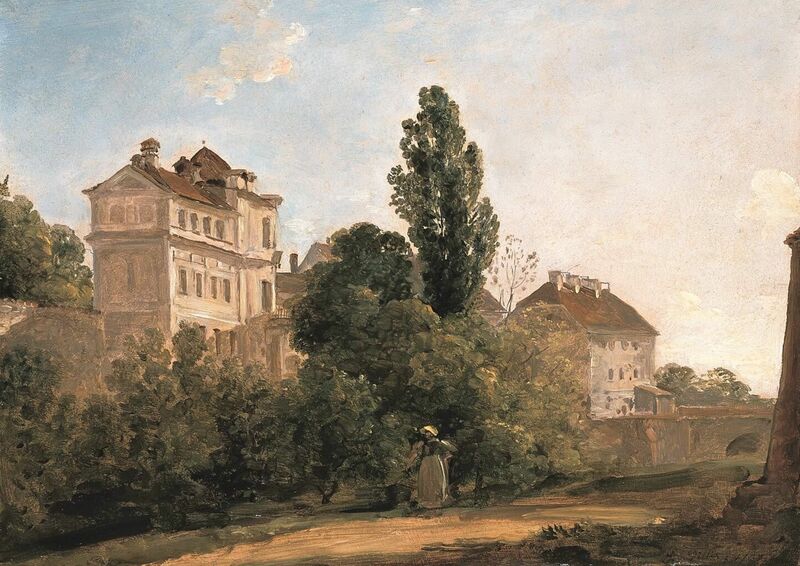 Johann Georg von Dillis (1759–1841), Triva Castle (1797), oil, 19 x 26.5 cm, Bayerische Staatsgemäldesammlungen, Munich, Germany. Wikimedia Commons. Johann Georg von Dillis’ delightful oil sketch of Triva Castle from 1797 is another early example of the use of Chinese White. Initial experience was that the paint didn’t dry well, and was not as opaque as (‘had lower hiding power than’) Lead White. These were not so noticeable in watercolour, where darkening in Lead White was a serious problem resulting from its exposure to hydrogen sulphide in the air. So Chinese White was quickly adopted in watercolour and gouache, but remained relatively unused in oil paints. 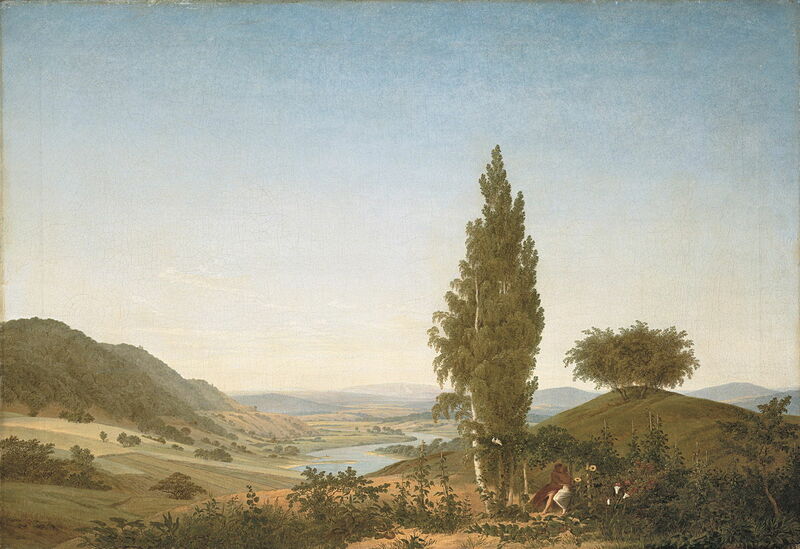 Caspar David Friedrich (1774–1840), The Summer (Landscape with Lovers) (1807), oil on canvas, 71.4 x 103.6 cm, Neue Pinakothek, Munich, Germany. Wikimedia Commons. Caspar David Friedrich painted his rather uncharacteristic The Summer (Landscape with Lovers) in 1807 using Chinese White. Franz von Lenbach (1836–1904), Village Street, Aresing (1856), oil on canvas mounted on board, 36.7 × 46.1 cm, Neue Pinakothek, Munich, Germany. Wikimedia Commons. 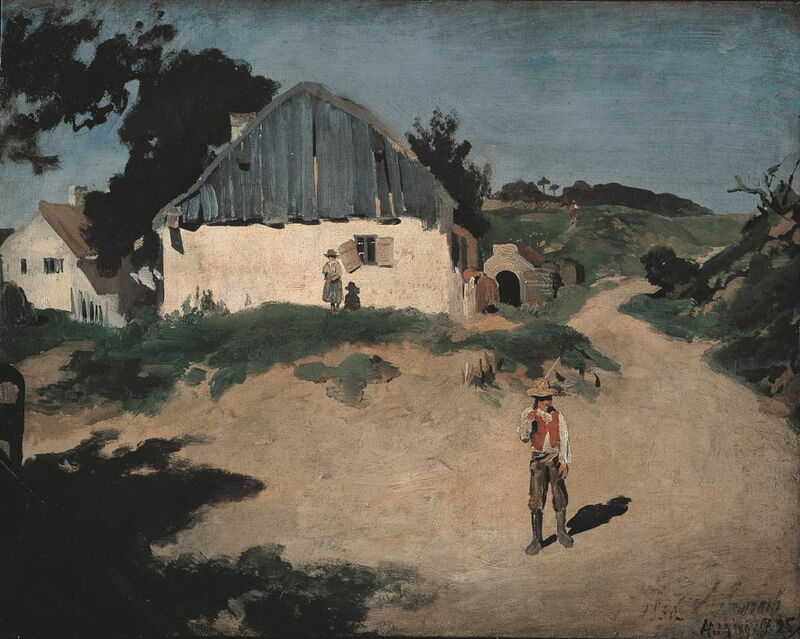 By the middle of the nineteenth century, when Franz von Lenbach painted this oil sketch of the Village Street, Aresing (1856), zinc oxide was being manufactured for use as a pigment, and offered at last in oil paint as well as watercolour. This was the result of the work of Leclaire in France between 1835-44, and it was he who improved its hiding power and incorporated drying agents to overcome its initial problems. 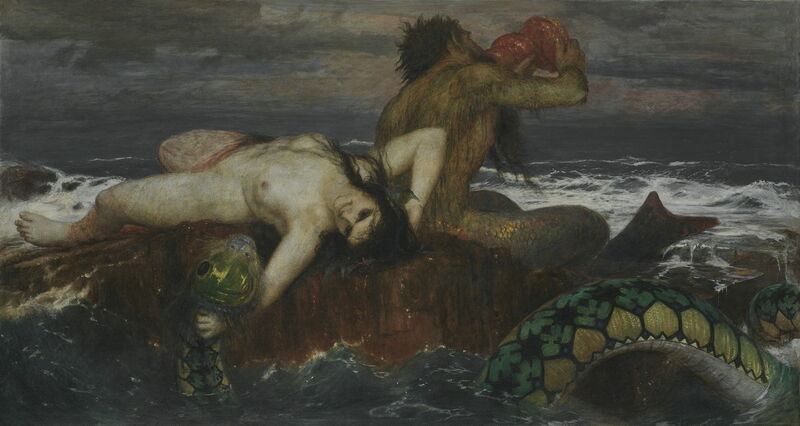 Arnold Böcklin’s Triton and Nereid from 1874 shows the use of Chinese White in another medium, that of tempera, where it rapidly displaced Lead White. 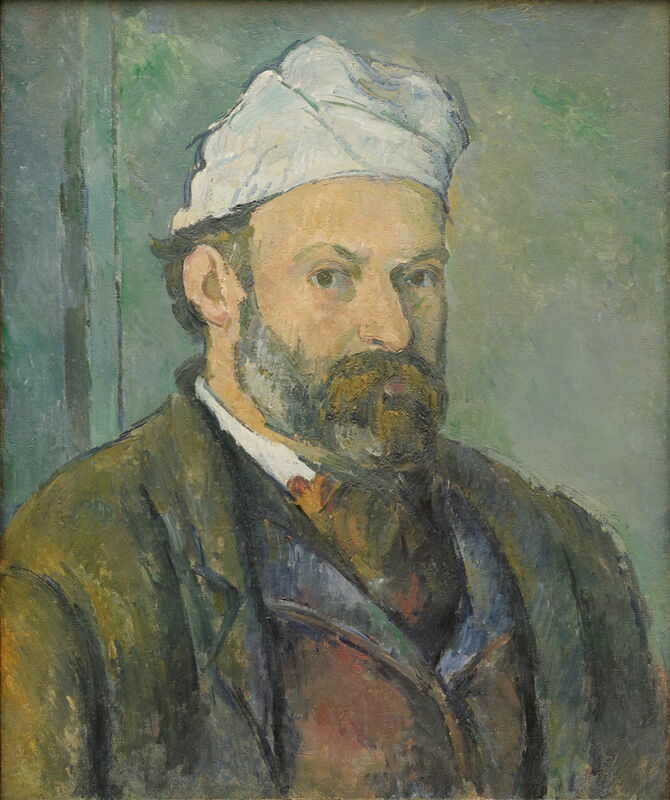 Paul Cézanne (1839–1906), Self-portrait (1881-82), oil on canvas, 55.5 x 46.2 cm, Neue Pinakothek, Munich, Germany. Image by Yelkrokoyade, via Wikimedia Commons. By the height of French Impressionism, Chinese White oil paint was quite popular, although in many applications it was used in mixtures with Lead White to ensure its hiding power and rapid drying. 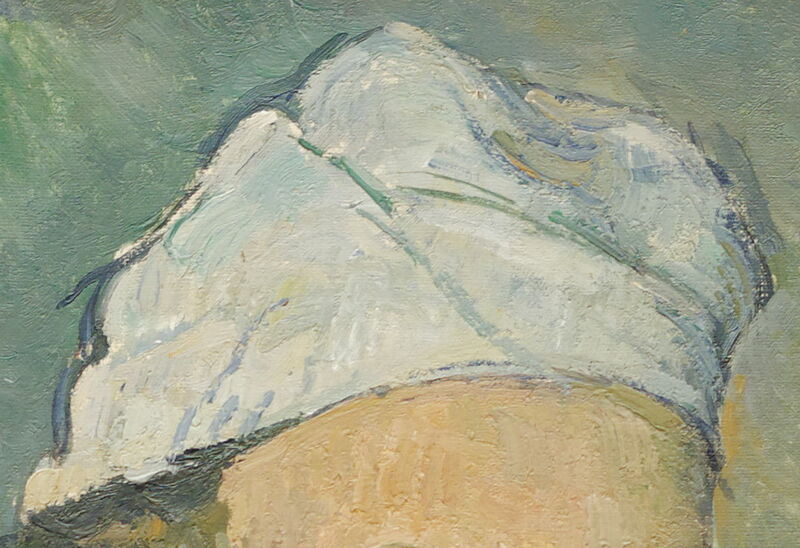 Paul Cézanne used it in this Self-portrait from 1881-82, most obviously in the white hat which he is wearing (detail below). He has applied the paint quite thickly, so there is no risk of it losing its hiding power over time. Paul Cézanne (1839–1906), Self-portrait (detail) (1881-82), oil on canvas, 55.5 x 46.2 cm, Neue Pinakothek, Munich, Germany. Image by Yelkrokoyade, via Wikimedia Commons. 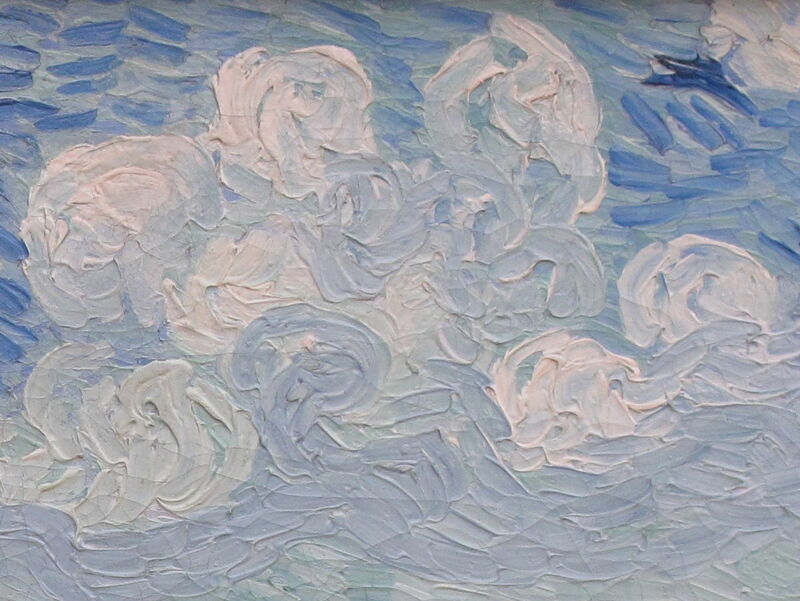 Vincent van Gogh used Chinese White in several of his paintings. 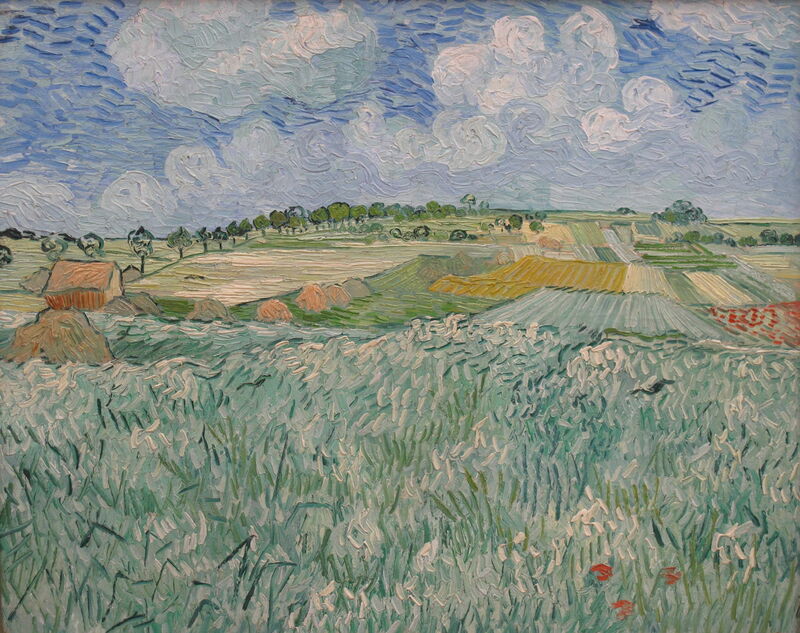 Perhaps the best example is his wonderful Plain near Auvers from 1890, also shown in the detail below. Vincent van Gogh (1853–1890), Plain near Auvers (detail) (1890), oil on canvas, 73.5 x 92 cm, Neue Pinakothek, Munich, Germany. Wikimedia Commons. Chinese White enjoyed its most popular period of use in oil paint between about 1890 and the 1920s, before its replacement, Titanium White, came onto the market. Lead White was becoming increasingly difficult and expensive to manufacture, and where it was still popular it was normally mixed with Chinese White. Being white, cheap, and largely non-toxic (except by inhalation), zinc oxide was widely used to bulk other paints, and to increase their hiding power. Artists who still avoided Chinese White as a pigment in its own right were often unwittingly using it in their white grounds, and in other colours. Gustav Klimt (1862–1918), Music (1895), oil on canvas, 37 × 44.5 cm, Neue Pinakothek, Munich, Germany. Wikimedia Commons. 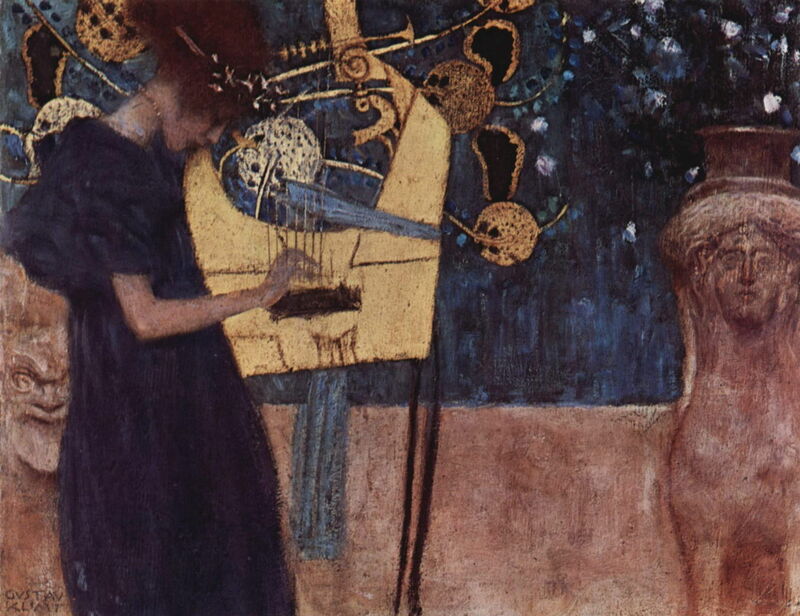 Gustav Klimt’s Music from 1895 uses little pure white, but has been found to contain zinc oxide pigment. 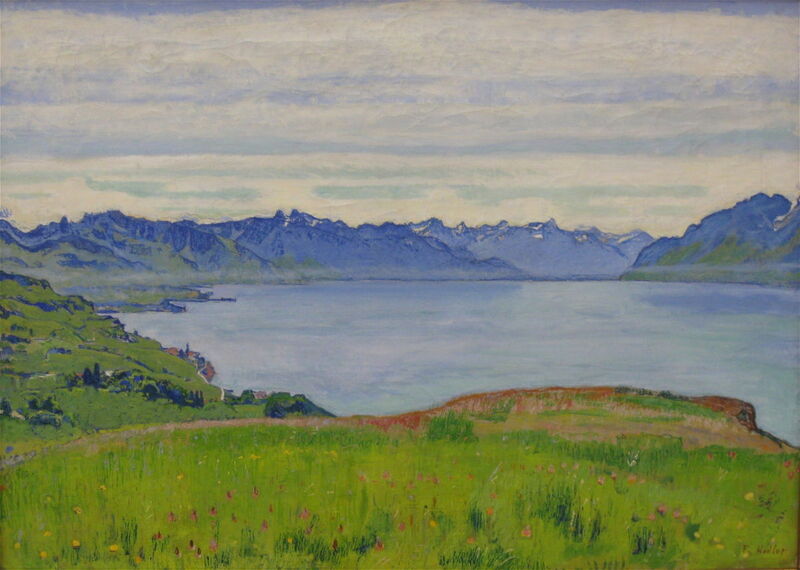 Ferdinand Hodler also used Chinese White in his Landscape at Lake Geneva from about 1906. The arrival of Titanium White in the 1920s has not resulted in the disappearance of Chinese White. Although now commonly used in oil and water media, Titanium White alone doesn’t make for a good paint layer, but one that is rather spongy. Many modern paints labelled as Titanium White contain quite substantial amounts of zinc oxide to deliver optimal handling and performance. Zinc oxide is still widely used to bulk other colours too. There is, though, a recently-reported danger in the use of Chinese White oil paints, particularly in oil grounds. Zinc oxide paint layers are now known to become very brittle, and can become involved in a process of saponification, particularly if water is present in the paint layer. Soap-formation is an ever-present risk in oil paint as it ages, and results in mechanical weakness of the paint layer, leading to oozing of paint from lower layers, sometimes even gross delamination and paint loss. There are some experts who consider that the use of zinc oxide in oil paint is hazardous to its longevity. Perhaps Lead White, for all its toxicity, wasn’t such a bad pigment after all. Hermann Kühn (1986) Artists’ Pigments, vol 1, ed Robert L Feller, Archetype. ISBN 978 1 904982 74 6. Posted in General, Life, Painting, Technology and tagged artists paints, Böcklin, Cézanne, Friedrich, history of painting, Hodler, Klimt, Morland, painting, pigments, van Gogh, von Dillis, von Lenbach. Bookmark the permalink.